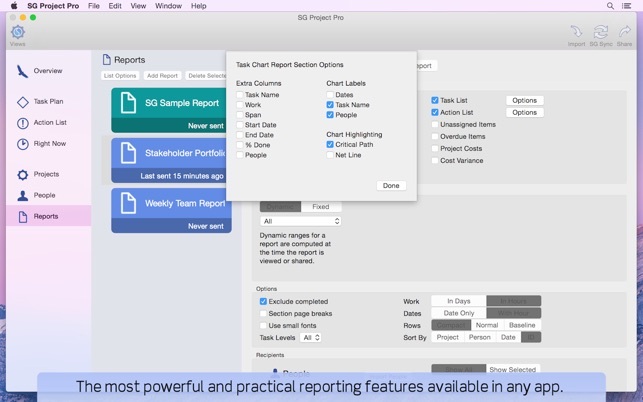 SG Project Pro is the flagship of the SG suite and is the only Mac app that provides a complete project management solution including task-based planning, management of issues, risks, action items, and costs, as well as powerful and beautiful reporting. It excels at managing multiple concurrent projects and team members in ways that no other project management app does. 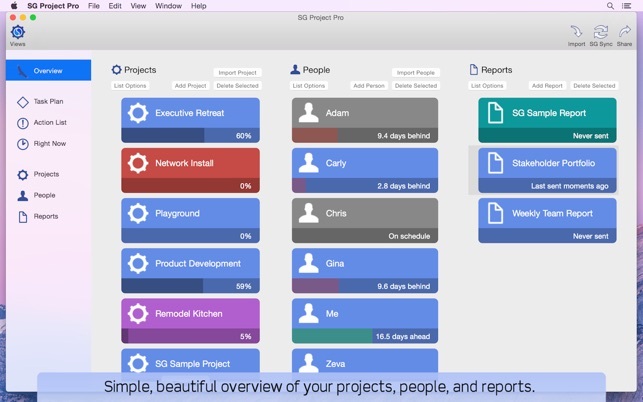 With SG Project Pro you will gain the confidence of being in control and understanding your projects, plus look brilliant to your team, management, and stakeholders. And since the SG apps are carefully designed for ease of use and productivity anyone can use them, while focusing on the project, not the app. 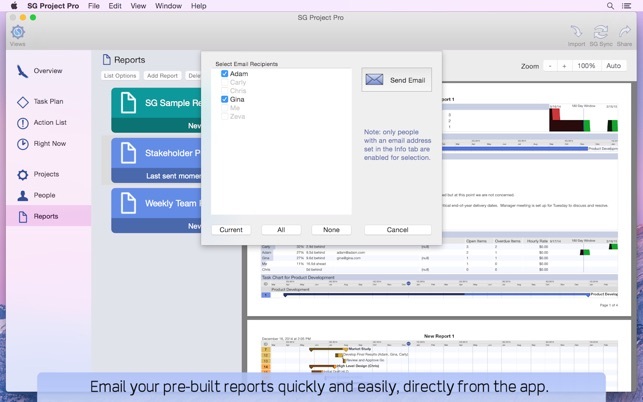 If you also use an iPad check out SG Project Pro on the iTunes App Store. SG's Dropbox integration makes sharing easy between all the SG apps! 1. 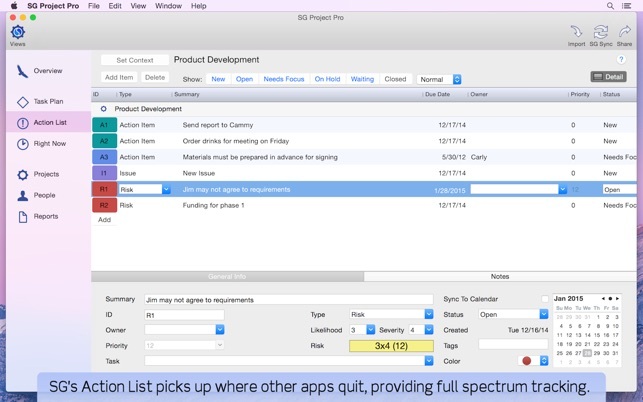 You can assign priorities to Action List items, but in a gantt-style Task Plan, priorities are not usually assigned. The priority is driven by the hierarchy, predecessors, etc. 2. You can turn off auto-linking of Tasks in the Preferences menu. 3. The Owner names are listed alphabetically by last name, or first name if no last name. So if you consistently put two-word or one-word names, you will get a great sort order. 4. Not sure why recalculate would fail. Possibly due to some circular dependency, although SG is good about preventing those. Whenever that happens, feel free to contact us through the app for support! I’ve been using SG Project Pro on both the Mac and on my iPad for sometime now and recently upgraded both platforms to the new 5 versions. These are both great upgrades and adds further enhancements and capabilities to what was already a great piece of software. These new features make it even better. There’s a new interface and the new reporting tool that allows custimazations of reports are excellent and saves a lot of time and efforts by allowing you to save different types of reports. Ease of use, powerful tools and features, and intuitive controls really make this product a great buy. I manage multiple construction projects usually between 6 and 8 projects at a time and this software allows me to stay in control and keep things moving smoothly and on schedule. SG customer support is also excellent and super responsive. I highly recommend this purchase if you are looking for the perfectly balanced project management solution and you don’t have the resources to drop several hundred dollars on products that provide features you will probably never use. Great job SG. 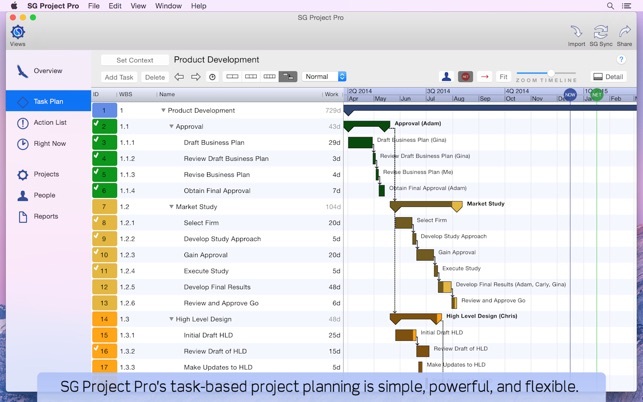 This is a great major update to a program that makes life easier for a project managers. I rarely write a review … but this really merits one. It is clear, grapically beautiful, fun to use and really helps to keep your projects running smoothly. Like anything else … it has a bit of a learning curve … but once you get it set up and understand the structure … it is very intuitive. It syncs beautifully across devices. Wonderful to be able to work on the big screen and then see the exact same thing on the iPad when you are at a site of want to work away from your office. On my systems is it completely fast with no delays at all. The customer service is truly the best … send an email to Ty … the developer … and almost invariably you get a response that day … even on weekends. I’ve been using the program for quite a while and it is wonderful to see suggestions incorporated into the design over time. The program is always being improved. One of the few programs on my systems that I use each and every day. It really makes managing projects fun and effective … especially if you have to manage multiple projects at the same time. Finally … it is great for communicating and helps in fostering better teamwork. Thank you Ty and SG. 10 Stars!